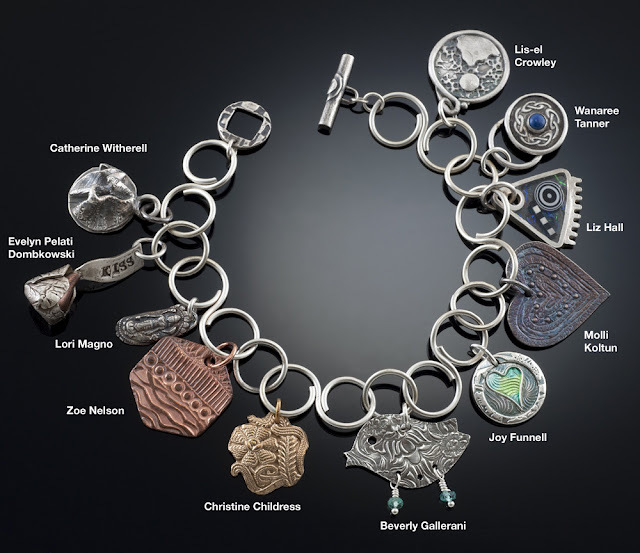 I am honor to be part of the Etsy Metalclay Team and it was in this group were I met Mieko and Lucia. These two wonderful ladies were not only talented but the nicest persons all the time. They always have nice words and a lot of support for all the other members of the team. Their work was beautiful and you could really see how much they enjoyed life and doing what they were doing. Sadly for all of us in the team, our teammates and friends Mieko and Lucia passed away recently. We are all very sad to have lost two beautiful souls and wanted to do something in their honor. 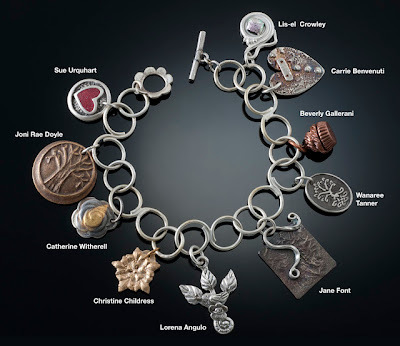 Members of the team donated a hand made charm made with silver, bronze or copper to create two bracelets. The bracelet chains are hand made with fused argentium sterling silver links with custom made taggles for each bracelet. The bracelet is 7 1/4 inches. We will raffle the two bracelets and all the proceeds will be donated to charities in their memory. The proceeds will be split 50/50 between World Vision (Mieko's favorite charity) and an art scholarship in Lucia's name. I made one of these beautiful charms, it is the bracelet with the flower toggle in memory of Mieko. Please help me and my team member by supporting our raffle, you will love to have one of these bracelets. Buying one ticket ($5 each) will give you two opportunities to win a bracelet. Visit this page to find out more information and to buy your ticket. Thank You in advance for your help ! I'm so sorry to hear this sad news. I am familiar with Mieko's work and always admired it. What was Lucia's shop name? This a thoughtful way to honor these talented ladies. I am happy to purchase tickets to help with the charity and scholarship. I'm not a member of the team, but if you'd like I can also post about this on my blog? Thanks for your beautiful words. I agree with you, Mieko's work was beautiful and Lucia's too. Yes please, if you want to post this in your blog your are welcome to it, the more we can spread the word the better. I am a Mexican artist and I currently live in San Antonio, Texas with my Husband and two wonderful kids. I am passionate about folk art and art in general. Working with metals, particularly metal clay, such as pure silver, bronze and copper, enables me to transmit through the pieces I create this passion I feel. I also enjoy making unique pieces of wearable art combining metal clay and traditional metalsmithing techniques using mixed media. My work is a big reflection of who I am , where I come from and my big love for my culture and traditions. ©2009-2012 Lorena Angulo All rights reserved. Simple theme. Powered by Blogger.